Desktop printer offers a big easy-to-read display and a host of features including 2-color printing (red and black), all at an affordable price. 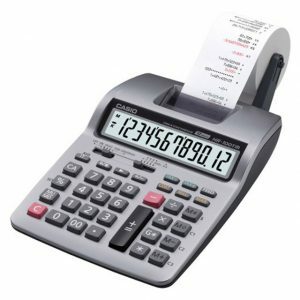 Casio HR-100TM printing calculator features include 2.0 lines per second, big display, right shift key and the adapter is included. This compact but powerful printing calculator is perfect for home or office. This calculator is capable of producing two lines per second, for fast entry and printing. With a large, 12-digit display that is 33 percent larger than comparable models, and it’s comfortable large-key layout makes it is easy to use, while reducing errors. The HR-100TM printing calculator makes tax calculations easy with the touch of a button – no more confusing features and complex functionality that can result in errors. Right printing calculator for the job, this calculator is right for what we need it for. It's buttons are big enough to make it comfortable to use. Has come in handy for keeping track of everything I make since I've started working for myself. Helps me to keep a paper trail as well. So I can go back for referencing if need be. Nice smaller calculator, I was looking for a calculators with tape for my small business. It fits the bill, was reasonably priced, and does exactly what I wanted. The only question I have is about refills. Will a standard roll of paper tape work? Easy to use and I love the larger keys. Now I have to figure out how to use some of the keys on the right that I hadn't had to use on older calculators. Perfect compact and does it all with a tape. Can handle any job. If you must have a printed tape this is it. Small but mighty! This Casio calculator is a perfect fit for my busy desk. It does not take up much room and gets the job done for me! If this calculator came with a better instruction manual I might give it four stars. The calculator has what I would call an unconventional key layout. For example, the key labeled with the = sign does not total a string of numbers. That function is activated by a key marked * which I think of as the multiply key. There is a special key with an unconventional marking that clears the registers and prints a zero. In short, the machine is confusing. Casio HR-100TM printing calculator. I have used this calculator in my office for some time and bought the new one for our Counting Team. They liked it. I rarely give anything less than a 4-star review because I just don't like to leave bad reviews. But come-on Casio. The keys on this are way too sensitive. You barely brush one with your hand and it's the same as if you fully pushed the button. I can normally add on these very very quickly without looking. No so with this calculator. It's way too sensitive and I'm constantly "hitting" (aka barely touching) numbers and buttons that I don't want to. I end up adding with one finger with this thing. I don't know why I didn't returned it. I guess I thought I would get used to it. Ha!